The travel industry is growing at a very high rate thus attracting stiff competition. The current digital world makes it even more severe. This calls for business owners to formulate ways to deal with their rivals and remain the best in the internet market. The most efficient way for achieving this is using an effective travel landing page template. A Landing page is a standalone website you generate from the main website to convert your visitors into leads through inciting them to undertake certain actions. The main objective of your travel landing page should be creating and building awareness about the traveling business. Use a name that is instantly recognizable and which your target audience can easily relate to. Clearly, feature the name above the fold. This prevents people from skipping over your idea from lack of clue about your name or how to find you. The purpose of your headline is to inform readers about your offers. Make it short, precise and clear otherwise people will be bored and just click away without giving much attention on your page. Do not conflict your CTAs. Give priority to actions that are of great values. Ensure that you have one call to action above the fold to help you retain users who cannot easily figure out the action to take. After getting the attention and concentration of your audience, consider reeling them in. However don’t use too many words above the fold since this may discourage your readers. Start simple and get deeper depending on the depth of details you want to provide at each stage. Use bullet points in your description. You can also introduce the particular features and benefits of your app to make it more convincing and credible. Use images to enhance memorability and care for the audience who are not willing to read through your landing page. Ensure that the image is simple, clear and related to your travelling landing page. Include social media sharing button to make it easy for your visitors to evangelize what you offer. Be precise and only include buttons for the social platforms used by your intended audience. The good thing about a sharing button is that it will increase social network for your landing page. You do not want your visitors to abandon your page without doing what you want them to do. Do not assume that they will just know the action to take, instead, invite them to perform the task. A call to action can be in the form of a button, a link or a sentence. • Make the CTA stand out and easy to locate. • Use a button with contrasting color from your design and make the button large enough. • Use strong and actionable words. • Make it the obvious next step by not giving many options. • Have great values, otherwise they will be considered spam. • Relevant and related to your travel landing page. Who doesn’t like cheaper deals? Some clients may postpone buying their tickets with the hope that the price would reduce on later dates. Encourage them to return to your page by offering them cheap airfare. Convince your potential clients that timeshares are worth considering despite their high costs. You are supposed to customize your form to make it more appealing to the eye and enticing to take this action. Using a contrasting colour, positioning the button about timeshares above the fold and giving great vacation images are effective ways to sell the benefits of timeshare vacations to your clients. Save your clients the stress associated with planning, budgeting and booking vacations. Consider market cost of these services to help you quote the best prices on your landing page. Consider the four tips below to make it more effective. 1. Remove main navigation to avoid distractions and confusion. 2. Use images to make it friendly and to enhance readers’ memorability. 3. Add testimonials and reviews from your previous clients to build trust. 4. Use precise and value-driven headline and a strong call to action. Give your clients the opportunity to read various travel reports. Provide clickable download button and avoid the generic ‘’download’’ button as much as you can. Instead, use strong actionable words with a sense of direct benefit. You can use a lot of white space to draw attention to the most important element. Rental cars are very necessary in the travel industry. With the stiff competition in this niche, you may opt for a landing page to reach your clients and expand your market command. List all the rental car suppliers to boost trust and credibility. Traveling cost alone may be high, then you want to add travel insurance fee. Most of your clients will consider this an expensive and unnecessary expenditure. It is your duty to convince them otherwise through optimizing your landing page. Use a short headline, descriptive and value-oriented sub-header, remove main navigations and use a multi-step form to let your visitors know how long the process is. You can use your landing page to encourage people to purchase tickets online at a discount. Use a beautiful image and persuasive and benefit-oriented form. Make your page mobile friendly so that your visitors can access it on a later time through their mobile devices. Provide useful information such as location and contact information for your mobile searchers and urge downloads through the app extension if you have one. Put more efforts to market your page during winter and summer since this is the time people travel most. You can increase your budget during these times to cater for the higher conversions. Use season sensitive words like ‘’Escape the office’’ to make it more enticing. You can also expand your clientele by creating a game plan. Bid on your own brand terms to outsmart your competitors and get maximum conversions. This is because bidding on your own terms makes you more aggressive and gives you the chance to reach full impression. Be with your client right from booking, during the actual journey, during their stay and even after the journey. You can easily do this on your page by providing necessary tips at each stage. 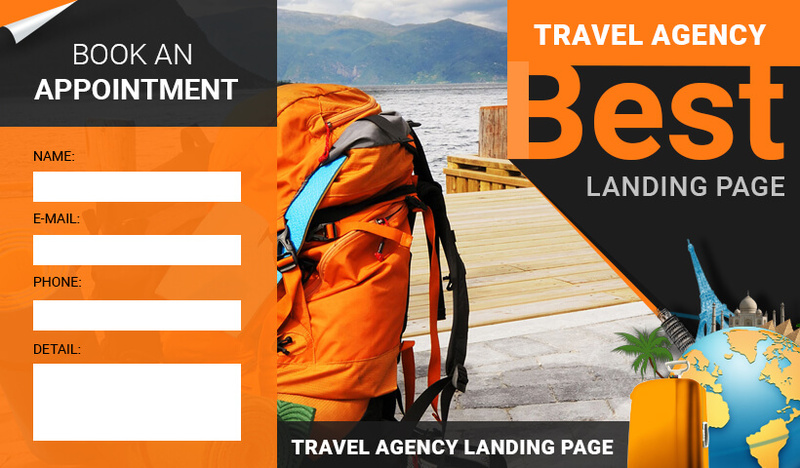 Implement these tips to feel the change in your travel landing page template. And if you are stuck, consider contacting Lander for professional help.